While most of my brews are fairly moderate in alcohol (6-8%), I tend to stray away from big beers for a handful of reasons: mash tun size, expensive ingredient list, and its difficult to achieve a balanced beer. My mash tun simply can't handle the quantity of grain needed to brew an alcoholic monster. 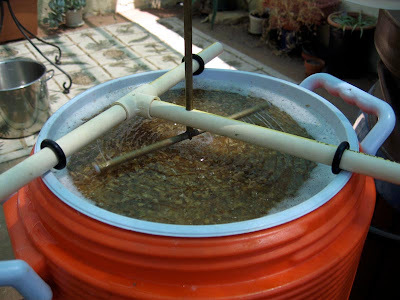 My current mash tun uses a 5 gallon Rubbermaid Water Cooler and I know they also come in 7 and 10 gallon sizes. I could easily upgrade just my mash tun to accommodate larger grain bills. As far as fitting a false bottom to a new mash tun, those come in a number of sizes as well. Northern Brewer carries a number of False Bottom sizes and types. MoreBeer also has a decent collection of False Bottoms. Making 5 gallons of strong ale styles such as barley wines needs about 20-30 lbs. of grain. I find that my 5 gallon cooler is maxed out at 15 pounds of grain. Potentially, I could squeeze in a few more pounds at the expense of potentially losing yield but I like to keep the mash bed light and fluffy during sparging (see images below). I can either find a larger solution or just hold out a bit longer to upgrade to a brewing sculpture with a double sized mash tun. My vote is for the later! 5 Gallon Rubbermaid Water Cooler holding just over 15 lbs. of mash during vorlauf. Just enough room to use a Phil's Sparger, my 5 gallon mash tun seems maxed out at 15 pounds of grain. If you don't quite have the capacity to make a big gravity beer using grain, there's a couple of options for you to try. 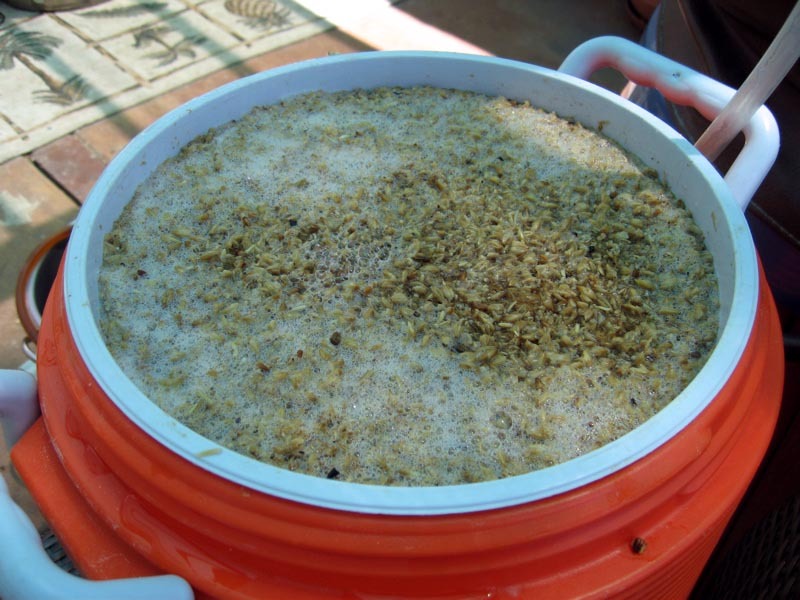 First is to do two mashes and use only about 1/3 of your normal sparge volume. Most of what you will collect during each mash is high gravity first runnings, or the sweetest collection of wort. You'll get low efficiency and increase your brew day by a few hours but it works! Second, you can just add malt extract to the kettle. This is what I did today. In a big beer like a barley wine, using extract to boost the gravity of your grain batch will not be noticeable in the final beer. The downside is that extract is always damn expensive! Making bigger beer styles is really like making two beers in one. In doing so, you can expect to double your costs. If you're using any quantity of extract, you can nearly triple the cost. Compared to a basic style such as pale ale, a barley wine needs more than twice the base and specialty malts and could use 2-3 times more hops. The goal in big beers is balance. I find that even pro brewers have difficulty finding balance in their bigger beers. Balancing alcohol with the right amount of residual malt sweetness, bitterness, and hop flavor is very challenging. You need to plan for more than just the final bottled or kegged beer; planning for profile changes during longer-term storage should also be a consideration. Knowing how your beer is going to change over 6 months to 3 years adds another level of complexity. Fermentation and attenuation can also be problematic. With a large fermentation task at hand, big beers require lots of attention to yeast. This means a large pitching rate of healthy yeast, well oxygenated wort, and maintaining steady fermentation temperatures. Worse case scenario, your yeast craps out and you get a stuck fermentation leaving you with a sweet, partially fermented, beer that will just make you cry. For the level of cost investment and time needed to mature a big beer, its a science and an art to get good results with high gravity brewing. Time to flush all that worry out with a good beer and chillindamos. Every new brewing adventure mandates some "research". 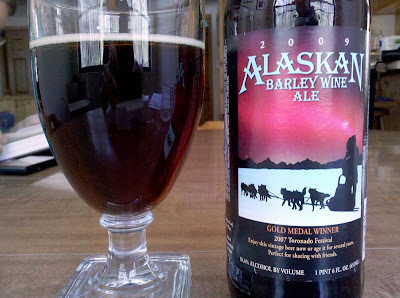 One of the best Barley Wines I've had recently was made by Alaskan Brewing Company. I had their 2009 Alaskan Barley Wine Ale this past winter. Thought I would age this bottle for a year but made the mistake of not hiding it! Earlier this week, I was in San Francisco and toured Anchor Brewing Company (more on that later). I had their Old Foghorn Ale which was also a great barley wine. 1 oz. Simcoe 60 min. 1 oz. Simcoe 40 min. 1 oz. Amarillo 20 min. 0.9 oz. Homegrown Chinook 10 min. 0.75 oz. Homegrown Centennial 10 min. Update 8/26: Racked to secondary. Current gravity is 1.018 @ 75°F. Added dry hop. Update 11/7: Racked to 3 gallon tertiary on 1oz. American Oak Chips. Other 2 gallons went in a keg for carbonation to be bottled on 11/11. I will be submitting a bottle of this to our Club Only Strong Ale competition. Tasting the hydrometer sample was very promising. The oaked split will sit for another month before bottling that portion. I plan to submit that to the Wood Aged Competition next year (two beers with one brew!). Update 11/27: This beer won 1st place in our club-only strong ale competition. Shipping out for the AHA Club-Only competition hosted by Greater Everett Brewers League in Washington. I have the same Mash Tun as does probably 1/2 the All Grain homebrewers. What was your grain-water ratio? I was trying to figure out my potential gravity limit. Also how do you measure the temperature at the top and bottom of your mash tun? Do you have a temp probe in a stopper at the bottom? Hi Jeff! I typically shoot for 1 quart of water per pound of grain. I've tried using 0.9 quarts per pound with bigger batches but have found it to be more difficult to stir the mash when doughing-in and when distributing heat at mash out. At the time of those pictures, I add a second infusion to fluff the bed before beginning vorlauf. As for temperature. I use a detached long probe that reads the bottom 2 inches or so of the probe. I measure the bottom center, middle, and the top of my mash. I try to keep the temps within 2° F of each other. If its greater than 2°, I gently stir (moving grain circular from bottom to the top) to distribute heat. If I get a sculpty next year, I'm totally getting the biggest mash tun that fits. Good to know your max grain and mash thickness. I don't do many high gravity beers but next year I'd like to brew an Old Ale and Scotch Ale. That temperature probe sounds pretty neat, I just have a small kitchen probe. But in the next week or so I am going to put a permanent probe near the bottom of my mash tun. I think it is a good idea to get a better picture of the mash temperatures.